JUKI's unique feed mechanism promises excellent efficiency of feed. In addition to the standard models of 1-needle and 2-needle machines, other models intended for special purposes are available, including models for extra heavy materials and one having a thread trimmer. The machine is applicable to an extended range of heavy materials for industrial use, such as cargo handling belts and containers, as well as those for general use, such as car seats, sofas and bags, thereby contributing to both improved quality and increased productivity. The new mechanism with a rectangular feeding motion promises consistent feed of materials of all thickness without stitch gathering. 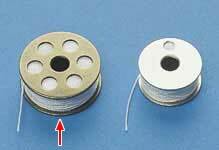 The "needle" inserts into the fabric during the returning motion, which is likely to produce gathered stitches. 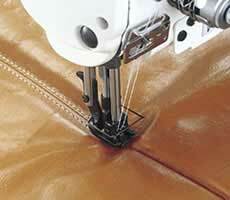 Compared with the elliptical feed, the rectangular feed helps reduces gathered stitches.  The locus of the "needle" and "feed" motions are nearly rectangular. 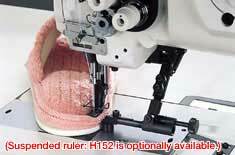 This prevents stitch gathering and provides efficient feed on multi-layered portions of material. The machine has adopted a new mechanism that does not change the ratio of alternate vertical movement of the walking foot and presser foot even when the material thickness changes. Even when a heavy material is used, the presser foot lift does not decrease. This means that the presser foot comes into contact with the material at exactly the same time that it does when sewing lighter-weight sections of the material. As a result, the walking foot retains the material with a consistent pressure to prevent irregular stitches. The amount of the alternating vertical movement of the walking foot and presser foot can be adjusted up to the maximum of 6.5mm according to the height of multilayered portions of material. With the adoption of a new rectangular feed mechanism, an alternating vertical movement mechanism, and a unison-feed mechanism, the machine can feed heavy materials powerfully and smoothly. Well tensed seams are consistently produced without pitch errors. 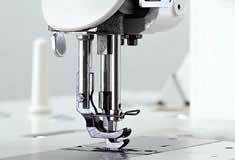 With its maximum stitch length of 9mm, the machine can be applied to a broader range of uses. 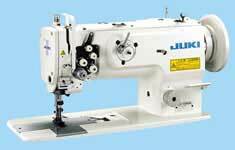 The LU-2200 gauge type is a newly developed design. 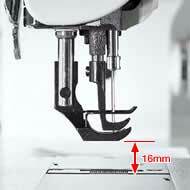 The high, 16mm (13mm for LU-1565N) presser foot lift enables easy material handling. With the adoption of this vertical-axis double-capacity hook, the frequency of bobbin thread changing is reduced, promising sewing work of increased efficiency. 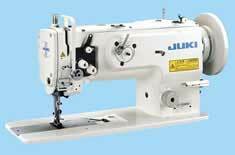 1-needle, Unison-feed, Lockstitch machine with Vertical-axis Large Hook. The standard 1-needle type machine that delivers the basic functions and performance best suited to the sewing of heavy materials. 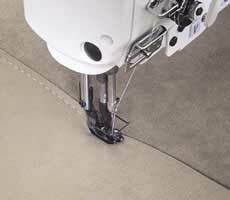 The maximum stitch length is 10mm. 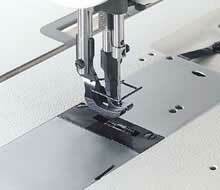 The complete rectangular feed locus enables accurate feed of extra heavy materials while preventing stitch gathering. 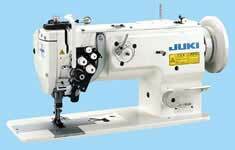 With its sufficient needlebar stroke of 38mm and long 190R needle, the machine supports the sewing of extra heavy materials. The machine comes with an extra large steel handwheel with a diameter as large as 175. Automatic lubricating mechanism helps improve maintainability. The machine is provided with a sub oil pan and double filter to keep dust from entering the oil. The machine is equipped with a bottom-feed adjusting mechanism that adjusts the amount of bottom-feed while keeping the needle feed fixed. 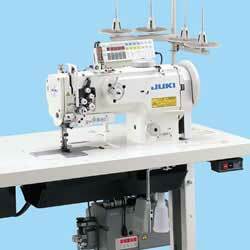 With this adjusting mechanism, the machine can prevent uneven material feed without changing stitch pitches. 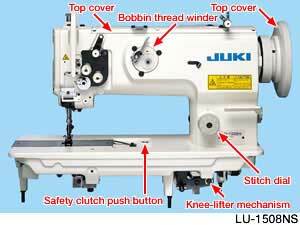 The standard 2-needle type machine that delivers the basic functions and performance best suited to the sewing of heavy materials. Automatic lubricating mechanism improves maintainability. The sub oil pan and double filter prevent dust from entering the oil. The organized split needle bar mechanism makes it possible to stop or reset the left or right needle by operating a one-touch utility lever. 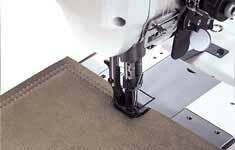 The machine produces neatly finished stitches at corner parts of the material. The machine is provided with many improved features that offer enhanced operability such as an easy-to-observe area around the needle, placement of the bobbin winder on the front face of the machine arm, and a large handwheel ( 160). 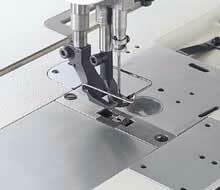 The machine is full-open-type top design makes it possible to fully open the top of the machine arm. Thanks to this design, adjusting works can be done without tilting the machine head.